JACK Quartet performing String Quartet, II. Fugha in February 2019. Commissioned for the Lydian String Quartet at Brandeis University by the Lydian String Quartet Commission Prize 2017 generously funded by a gift from anonymous donors. 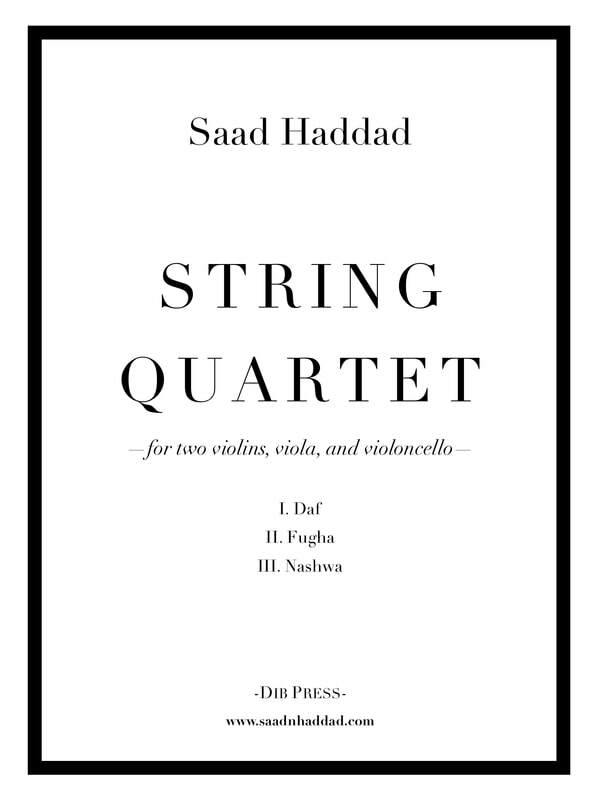 This work is my first major string quartet which deals with a large architectural structure divided into three movements entitled Daf, Fugha, and Nashwa. The work traverses many areas of traditional Middle Eastern music as they relate to pitch, ornamentation, meter, and timbre, and seeks to amalgamate those characteristics with traits typically found in Western classical music, like development, modulation, and harmony. I. Daf is named after the frame drum commonly used in traditional Middle Eastern ensembles. In a typical setting, this drum provides the meter for the rest of the ensemble to improvise within. However, in this movement, the quartet develops the rather straightforward meter that is presented in the first few moments, performing the rhythmic pulses themselves in a seemingly improvised, though thoroughly composed, manner. The subtle nuances of daf technique are showcased by means of using the players’ left hands to strike their fingerboards as a pseudo-outer ‘skin’ of the daf. II. Fugha, or ‘fugue’ in Arabic, borrows its structure from the harmonic motion of Johann Sebastian Bach’s Fugue in F-sharp minor, BWV 859, from Book 1 of The Well-Tempered Clavier. I have always wondered what it might have been like if Bach was born in Alexandria, rather than Eisenach, and what harmonic discoveries of sorts he might have made in pursuit of his perfect counterpoint. The movement is organized into several contrasting sections of “quasi-cadenzas” and “episodes” that directly correspond to the original fugue’s material, however told in my own personal way. ​III. Nashwa, or ‘trance’ in Arabic, is a fantasy on the maqamat, or Arab modes, through an aural meditation that begins with swells inspired by the resonance heard inside the oud, an Arab lute. As the movement continues, the sound profile makes its way out of the oud and into the external sounds of the qanun, an Arab zither comprised of over seventy strings and played with long plectrums. Its surface level sounds are abstractly depicted through sforzando and tremolo techniques from the quartet. The last section brings the ensemble back into the oud, eventually ending with one final swell.